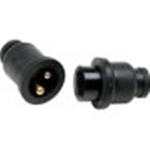 Polarized 2 contact connector. For marine and automotive use. Molded ABS interiors. Protected by PVC caps. For 6V, 12V and 24V applications. 10A @ 12V.